In London this weekend, Zaha Hadid was awarded the Royal Institute of British Architects (RIBA) Stirling Prize 2010 for her Maxxi Museum design in Rome. With the award, Hadid's firm will receive £20,000. 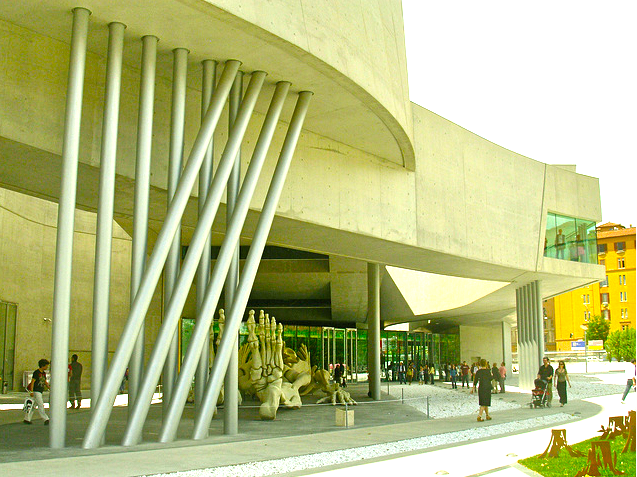 Maxxi, the first modern art museum in Rome, was finished this past May of 2010. It's considered to be Italy's national museum of art for the 21st century. The project took about 11 years to execute. And because the design displays substantially vibrant and detailed artistic expression as in the case of Frank Lloyd Wright's Guggenheim in New York, there's a lot of controversial murmur on whether or not the Maxxi can properly exhibit works of art without having to compete with Hadid's construction. Have a watch at the video to see the opening ceremony of Maxxi this summer and how the Stirling Prize winner debates this very notion of the architect's vision versus the art housed within it (after the jump). Among the contenders were the Neues Museum by the David Chipperfield Architects and Julian Harrap Architects, the Ashmolean Museum by Rick Mather Architects, Bateman's Row by Theis & Khan Architects, Christ's College School by DSDHA, and Clapham Manor Primary School by drmm.